... Hold it outstretched, pull an arrow through it and let the arrow fly. That's pretty much it. If someone would have told me the Olympics would make me learn a sport or a skill I would have laughed once. But now I know. I haven't watched archery in the olympics. A friend did. He got inspired and picked it up. And when he talked of it I wondered why I should not be doing it. It is a cool hobby to have! 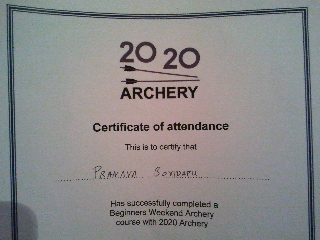 So I learnt it last weekend at a beginners course. And it was fun. Awesome fun. My arm still hurts but I still wish I could try today. But alas many a times I tried stuff and let go very soon, may be too soon. Just hope it's not one of those things.